Please check your code an re-post it. Try setting s_p3( outside of CVX to any 4 by 4 matrix. Then p3*s_p3*H_p3 and G_p3*s_p3*G_p3' need to be evaluable by MATLAB, i.e.,have conformal dimensions. If not, then toy CVX code will not work. Sorry, I am currently running my code that G_p3s_p3G_p3 andtrace(G_p3s_p3G_p3’) is consistent,am I right? Please refer to my first code of G and H and maximize line)! Your corrected code is accepted by CVX. But for all the random values I sued for H_p3 and G_p3, the problem was always (primal) infeasible. 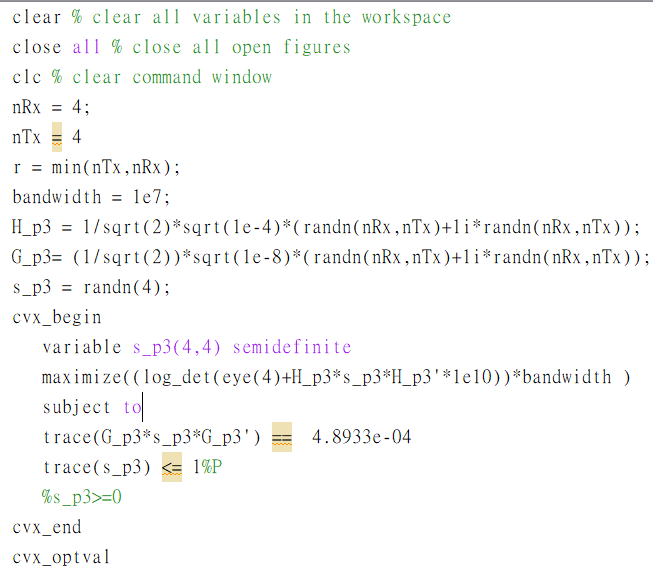 Note that the statement s_p3 = randn(4);has no effect, because s_p3 is declared as a variable in CVX, and that supersedes (overwrites) whatever s_p3 consisted of before it was declared a variable in CVX. I probably understand what you mean. Is there a problem with this code? 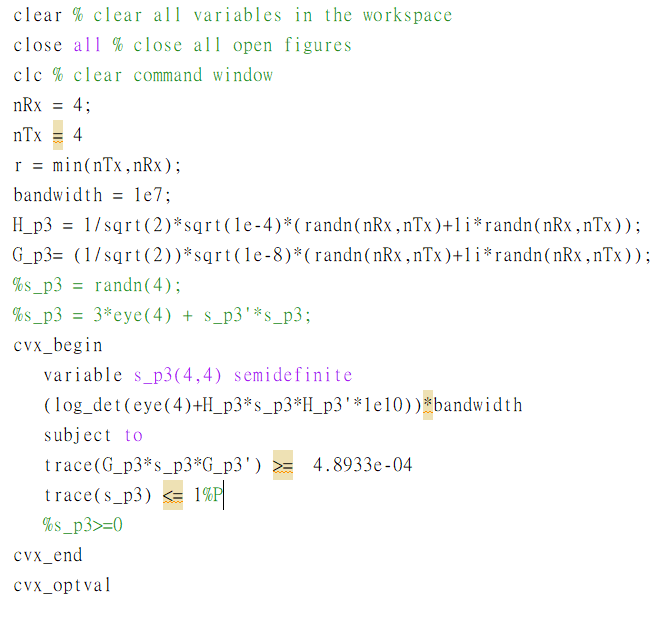 As I wrote,s_p3 is overwritten before it is used. So that code line does nothing. If you want to do something in this line of code, then you need to do something different that what you have done. As for the infeasibility, there is no matrix which is simultaneously symmetric positive semidefinite and satisfies the tow trace constraints, at least for the random numbers I tried. In order to assess feasibility, you can simplify things by eliminating the maximize statement. That way, CVX and the solver won;t have to deal with the complexities caused by logdet. I just want to set the s_p3 to a 4x4 matrix. Can you give me some advise to run this code? Homogeneous problem detected; solution determined analytically. Next how can I try to find the maximum value? I don’t know what problem you just solved. Please show the entire code which produces cvx_optval = 0. By the way, my code’s multiplication sign always disapear, do you know how to make the multiplication sign appear normally? And there is more that you did than maximize. You changed the first trace constraint from == to >=. There is nothing to maximize unless your problem is feasible.You have now yet shown a reproducible problem which is feasible. You can not rely on randn in your code to provide a reproducible problem. Do you mean that I have problems with randn when I generate H_p3 or G_p3? “Experts” on the forum can not reproduce your results unless we know which random numbers were used for H_p3 and G_p3 in the problem instance for which you are showing results. Here is an example of how to post reproducible code for H_p3, even though originally using randn. Doing it this way ensures reproducibility, even though only 16 digits are displayed. Run the following in your “private” code. Hello, I have been thinking about this for a long time, and asked my colleague to help me execute my program. The result was unexpected, the cvx program was executable. Have you ever encountered such a problem? Is it possible that I have installed fewer components? If you are getting different results than other installations, try removing all CVX directories (folders) from your MATLAB path, delete all CVX directories, then install a freshly downloaded copy of CVX 2.1. Before you do that, what is the output from cvx_version ? Install the latest build of CVX 2.1. Do not use CVX 3.0beta, which is known to have many bugs.